Do you have what it takes to represent your club in the OB Sports National Team Championships? Qualify to play in the OB Sports National Team Championship. This national final event rotates venues but is typically contested in December of each year. Qualifying events at participating OB Sports courses are contested throughout the Summer and Fall. You'll compete against players (and their club's professional) from around the country. The OB Sports Invitational Cup Matches are the gathering for all of OB Sports Golf Management’s private facilities and additional clubs by special invitation. The event creates an opportunity for the members of OB Sports-managed facilities to enjoy the other facilities in the network and to interact and become friends with other members of our private clubs in a fun yet competitive golf environment. 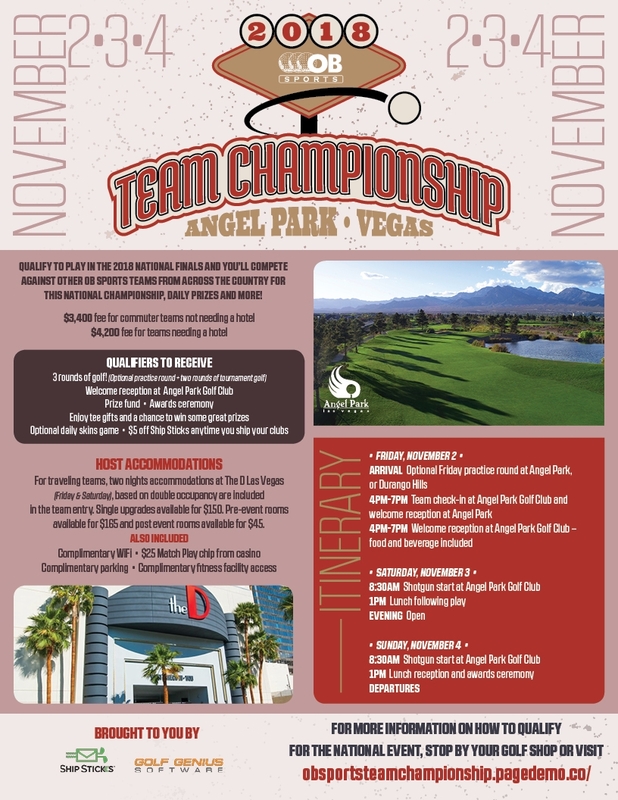 Hosted at Angel Park Golf Club - Las Vegas Two person teams of one professional and one amateur, compete for over $17,000 in cash and gift certificates throughout the two-day event. This popular Las Vegas event has played host to notable touring professionals (such as Robert Gamez, Jeremy Anderson and Ed Fryatt, to name a few) and fields teams from California, Hawaii, Arizona, Minnesota, Washington and beyond.